Alleyways weren't the only obsession during my first few years of life. The London Underground also captured my imagination. There was something about H C Beck's brightly coloured wiring diagram that plugged straight into my childhood brain and lit up all the bulbs. 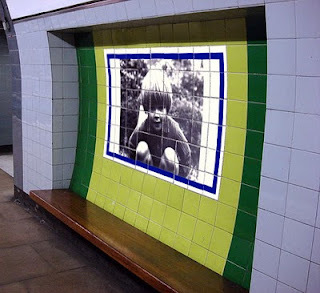 I first came across the Tube when we moved to London at the tail end of the sixties. Most of the time when we went into town we travelled by car but on a few occasions my Mum had to take us into town by public transport. We would catch the bus from the end of the road (opposite the police box, just outside Tesco) which would take us all the way to Seven Sisters where we'd get on the tube. Thus my introduction to the service was the Victoria Line. The new Victoria Line as it was known at the time. I seem to recall talk of the trains being driverless at first but that people got too freaked out by seeing no-one in the cab as the trains entered the platform so they installed a person there to reassure the travelling public. However, I can't find any record of the "driverless Victoria Line" now but clearly remember adults talking about it. Perhaps it was a suburban myth. However, they certainly were the first trains on the London Underground (as far as I am aware) to run without guards. The idea of a train guard on the tube seems weird now, but they were quite common back then. They lived just inside the front door of the rear carriage, roped off by a strap of elastic and with an array of intriguing bakelite buttons set into the end wall of the carriage in front of them. Large and colourful, they were the kind of controls you would imagine finding upon a close inspection of the TARDIS console. Train guards stood up a lot of the time but they did have a fold down seat they could use (and which canny members of the public could use when such guard carriages were in the middle of the train provided you knew how to release the catch). 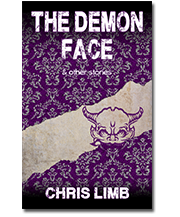 Most exciting of all was they way they used to leave the doors open after the train had departed, standing nonchalantly in the doorway with their head poking out, only ducking back inside to avoid having their heads knocked off by the tunnel entrance. I digress. The Victoria Line in the late sixties and early seventies was an exciting and futuristic experience with its blue-grey tiles and shiny metal escalators, such a contrast from the cream, purple and wood feel of the older sections of the network. Another feature of the line was the one I became obsessed with very early on - station specific murals that decorated the walls behind the benches on each platform. We never went south of Victoria or north of Seven Sisters so the concept of the murals on the stations outside this zone was mysterious. As it was I had to be content with familiarising myself with and decoding the murals available to me. Seven Sisters. Seven trees, a fairly straightforward concept. The trees were the sisters. Finsbury Park. A square green of a park containing a tree, but by far the most dominating feature of this picture were the crossed pistols. I had no idea what this signified, but decided that a pair of handguns must be known as a "finsbury". Whatever that was. Highbury and Islington. A castle. I assumed this was something to do with the castle I could see from the car when we drove into town (which was in actual fact Holloway Prison) and surmised that was where the station was (the mural actually depicted the now demolished Highbury House). Or maybe a castle was also known as a "highbury". Either made sense to me. Kings Cross. Another straightforward one - a cross made up of five crowns. Easy for the four year old mind to grasp. Euston. An arch known as Euston Arch, apparently the victim of a great injustice. A tragedy. According to my parents, horrible bastards had knocked down Euston Arch when building Euston Station even though they didn't have to. I felt obscurely guilty about this. I couldn't see how it was my fault but it felt like it. There are now plans afoot to reconstruct it - and even today that would come as a relief to me; I'd feel as if I'd been let off the hook. Warren Street. A bright orange maze or warren. No rabbits. When we were waiting on the platform there I used to try and trace my way out from the centre of the maze before the train came. I don't think I ever succeeded. Oxford Circus. A circle, with lines converging on it. Some kind of representation of Oxford Circus itself I decided. I felt grown up because I knew that it wasn't the kind of circus with clowns, but just the boring crossroads where John Lewis was. Near the BBC where my sister and I had spent the night once. Green Park. Some dots. I didn't get this one and asked my Mum. She said they were supposed to be blobs of paint on a palette because artists sold their paintings in Green Park. This was a more interesting explanation that the genuine one which turns out to be more bloody trees. Seen from overhead presumably. Victoria. Like King's Cross, an easy one for me to get my head round. It was Queen Victoria's head, the same head that appeared on some of the pennies I had in my wooden money box shaped like a rocking chair. These motifs became my childhood constellations, reassuringly familiar symbols I could use to track my progress across the capital. The ones I hadn't seen became almost mythical in my mind. I knew they must exist. Of course some of the stations weren't open yet; little notices on the maps in the carriages said so - anything south of Victoria wouldn't be open until 1971 and Pimlico wouldn't even be open until the futuristic sounding 1972! One day when we caught a bus my Mum asked the conductor whether it went to Seven Sisters. Apparently not but it did stop at Tottenham Hale. I still remember his words to this day. I was excited. I was going to see a new motif. I wasn't disappointed when we reached the platform. There was something enthralling about seeing a new instance of a familiar set of things and the Tottenham Hale motif didn't disappoint. 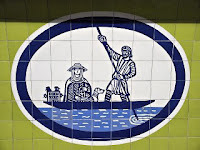 I had the same background colours as some of the other stations, but in the foreground an oval frame surrounded a medieval looking picture of a man and a woman in a boat. For some reason I thought the man was Jesus because he had a beard. ...and my Mum grabbed my hand and we got on the bus which had just pulled up.